All hail to the Americana gig of the year. The Dave Rawlings Machine, fronted by long-time musical partner of Americana singer/songwriter Gillian Welch, play an exclusive Irish debut at this year’s Open House Festival in Belfast on Saturday 11 September. Sharing the stage will be musical compadres, Old Crow Medicine Show, creating the perfect union of 'old-time string music and punk swagger'. Tickets are just £20 online from the Open House Festival website and feature our recession-friendly booking policy - no booking fees, no transaction charges, and no hidden costs. Another exciting addition to the festival line-up is Lissie, the 'guitar-toting Americana lovechild', marking her first visit to Belfast. She appears on Wednesday 8 September in the intimate surroundings of McHughs basement bar, with new local boys Napoleon. Other artists recently announced include Seasick Steve, Wilco, Low Anthem, the Felice Brothers, and Field Music – more acts to follow. 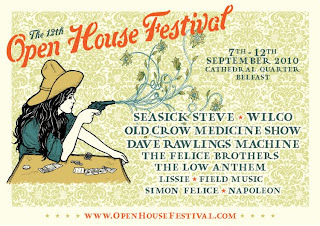 The 12th annual Open House Festival will take place 7-12 September 2010, throughout the arts-&-cultural-flavoured Cathedral Quarter. The main festival venue will be the new 2,000-capacity festival marquee in Custom House Square – the biggest music marquee ever to be erected on the site.